The world's first floating wind farm has started delivering electricity to the Scottish grid. Five giant turbines have been tethered to the seabed about 15 miles from Peterhead in Aberdeenshire. The wind farm has been officially opened by Nicola Sturgeon. The first minister said the project, which will generate enough power for about 20,000 homes, was testament to Scotland's "international reputation" for renewable energy. At 175m from sea surface to blade tip, the turbines are almost as tall as the Queensferry Crossing. They extend another 78 metres below the surface and are chained to the seabed to stay in place. Norwegian energy firm Statoil has been working on developing the project, known as Hywind, for more than 15 years. The floating approach allows turbines to be installed in much deeper waters than conventional offshore wind farms. This wind farm is positioned in water depths of up to 129m, whereas those fixed to the seabed are generally at depths of up to 50m. Statoil says up to 80 per cent of potential offshore wind sites are in waters more than 60m deep. The company believes floating turbines have the potential to work in depths of up to 800m. Ms Sturgeon said: "This pilot project underlines the potential of Scotland's huge offshore wind resource and positions Scotland at the forefront of the global race to develop the next generation of offshore wind technologies. "In addition to the green benefits of renewable energy, it also has a very significant contribution to make to our economy. 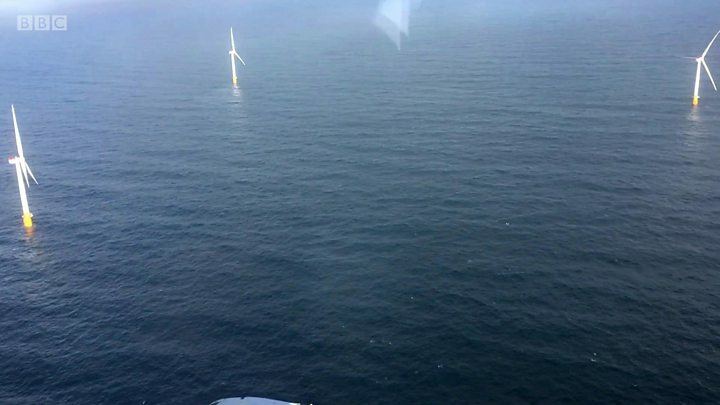 "I'm pleased Scottish suppliers have contributed to the Hywind project from the development through to the production phase and are still involved to investigate long-term potential for floating wind." Claire Mack, chief executive of Scottish Renewables, said: "Hywind's presence in Scottish waters is a reminder that, as the windiest country in Europe, and with some of the deepest waters and most promising offshore wind sites, Scotland is perfectly placed to capitalise on floating turbine technology. "Our unique offshore supply chain and the skillset it supports put us at the forefront of the deployment of these innovative machines." Bird charity RSPB Scotland opposed the project, not because it dislikes the technology but because it believes too many offshore turbines in the area have already been approved. It fears thousands of sea birds may be killed by offshore wind farms. The operation to tow the turbines into place from Norway was completed in August.